Producer Ekta Kapoor, the Tsarina of Indian television is now the mother of a baby boy. Just like her brother Tusshar Kapoor, Ekta too opted for surrogacy. Her first child was born on January 27. The Kapoor household is all set to bring the little home soon. Ekta has still not shared the news on social media yet. Tusshar welcomed a baby boy on June 1, 2017, who was named Laksshya by Ekta. She is a doting aunt to the one-and-a-year old and we bet she will be an awesome mom too. Hats off to the producer who is now all set to be a single parent. On the work front, Ekta Kapoor’s latest television offering, Kasautii Zindagii Kay, has been the talk of the town since its launch. 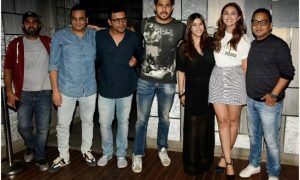 She also has several films lined up to release this year including Jabariya Jodi, Dream Girl, Mental Hai Kya, and Dolly Kitty Aur Woh Chamakte Sitare.